ougemont is a quiet unassuming village named after the red rocks nearby. 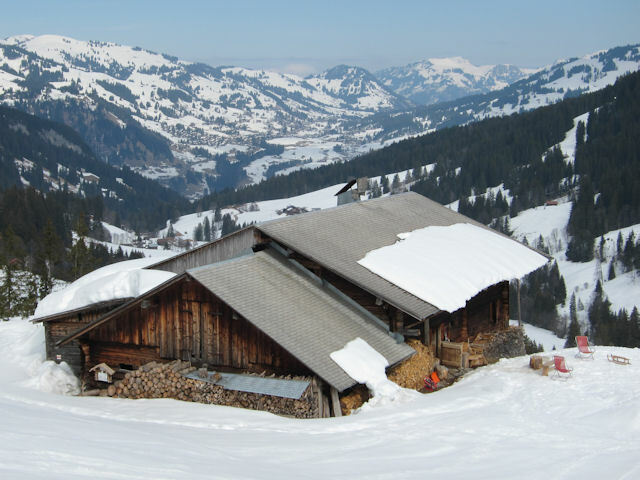 It gives good road and rail access to the second largest terrain in the Gstaad Mountain Rides network with a fast gondola station. 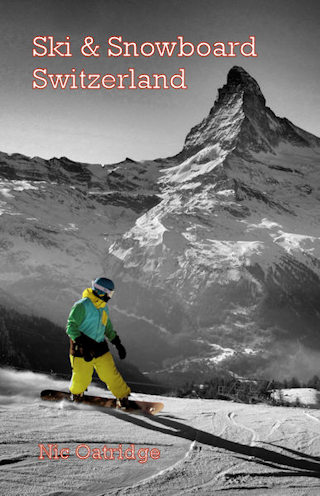 From La Videmanette you ski or snowboard down to Chalberhöni and enter German-speaking Switzerland - this is surely the only ski area in the world where a run takes you between French and German-speaking areas. After the Chalberhöni chairlift to Eggli you then have access to some lovely blue runs. The whole area is pretty good for snowboarders, despite a limited park, with no flats to speak of and mostly avoidable surface lifts. You do need to take one pretty easy (and scenic pretty) T-bar lift for a short section to get back to Rougemont, or you can always hop on the Montreux-Oberland Bernois-Bahn (MOB) back from Saanen. There is a 10k run to the bottom station from Videmanette, officially blue but probably a challenge for early intermediates. The black run off Vorderes Eggli is very easy, and much preferable to the blue alternative, particularly if snow cover is not good. 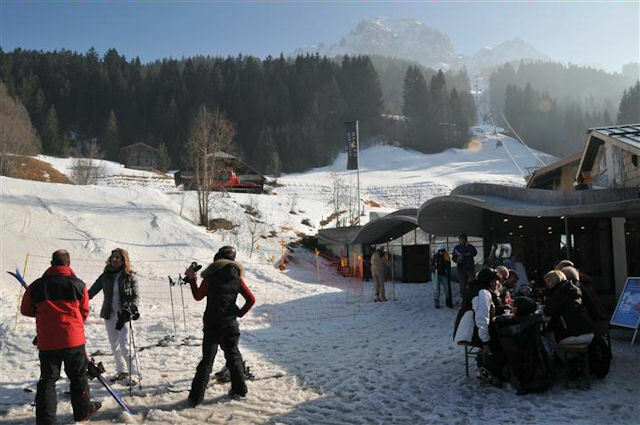 The best destination to access the downhill slopes by public transport in this ski area is Rougemont. Station 10 minutes to gondola - left out of station, then cross the railway track and roundabout. Note that the lift pass is good for local buses and the railway as far as Rossinière. Stations at Saanenmöser, Schönried and Saanen are all only a few minutes walk from valley stations. The Snow'n'Rail scheme gives you a lift pass with access for all of Gstaad Mountain Rides, but local passes just for the sector are also available. The resort operates the Snow'n'Rail scheme, providing a 20% discount on the combined travel ticket and lift pass. From Zurich the least travel time is 3 hrs with as few as 2 changes going via Bern / Zweisimmen. Typically, an adult one day combined ticket is 173.60 SFr, reduced to 112.00 SFr with a Half-Price card. From Basel the least travel time is 3 hrs 05 mins with as few as 2 changes going via Bern / Zweisimmen. Typically, an adult one day combined ticket is 159.20 SFr, reduced to 104.80 SFr with a Half-Price card. 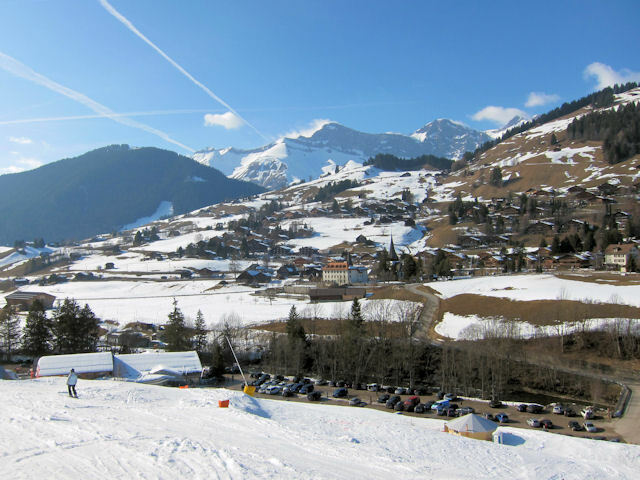 From Berne the least travel time is 2 hrs 24 mins with as few as 1 changes going via Zweisimmen. Typically, an adult one day combined ticket is 107.20 SFr, reduced to 78.40 SFr with a Half-Price card. From Lausanne the least travel time is 1 hrs 33 mins with as few as 1 changes going via Montreux. Typically, an adult one day combined ticket is 92.80 SFr, or 71.20 SFr with a Half-Price card. The road distance from Zurich is around 189 km and the journey time is roughly 2 hrs 25 mins. The road distance from Basel is around 180 km and the journey time is roughly 2 hrs 10 mins. The road distance from Berne is around 88 km and the journey time is roughly 1 hr 15 mins. The road distance from Geneva is around 151 km and the journey time is roughly 1 hr 55 mins. The road distance from Lausanne is around 86 km and the journey time is roughly 1 hr 15 mins. The road distance from Fribourg is around 64 km and the journey time is roughly 1 hr 1 min. Other resorts in the ski area include GstaadChâteau-d'Oex, Glacier3000, Saanen, Saanenmöser, Schönried, St. Stephan and Zweisimmen.